Astronomers at the Institute of Astronomy in Cambridge (UK) have reported the discovery of a "cold veil" of halo stars in the very outskirts of the Milky Way. They obtained the radial velocities of a sample of distant halo stars located from 80 to 150 kiloparsecs from the center of our Galaxy using the ISIS spectrograph on the William Herschel Telescope (WHT) and the FORS2 spectrograph on ESO's Very Large Telescope (VLT). The two most distant stars in this sample are Carbon stars observed with WHT/ISIS, and to date, they are the most distant field Galactic halo stars with radial-velocity measurements. An important finding from this work is that the radial-velocity dispersion of the observed stars is surprisingly low (or "cold"), ~50-60 km/s. Such a low velocity dispersion at large radii is probably telling us something fundamental about the mass profile of our Galaxy. The total mass may be much lower than we currently believe, and/or the mass distribution may be falling off much more rapidly than the standard Navarro-Frenk-White halo prediction. The group, led by Alis Deason of Cambridge University, used these radial velocities to estimate the mass of our Galaxy within 150 kiloparsecs. Even when tracer density and velocity anisotropy effects are taken into account, they infer that the mass is less than 1×1012 solar masses, and could be as low as 0.5×1012 solar masses. This result suggests that there may be a dearth of dark mass in the outskirts of our Galaxy. Top panel: Radial velocity of tracer populations in our Galaxy as a function of radius. 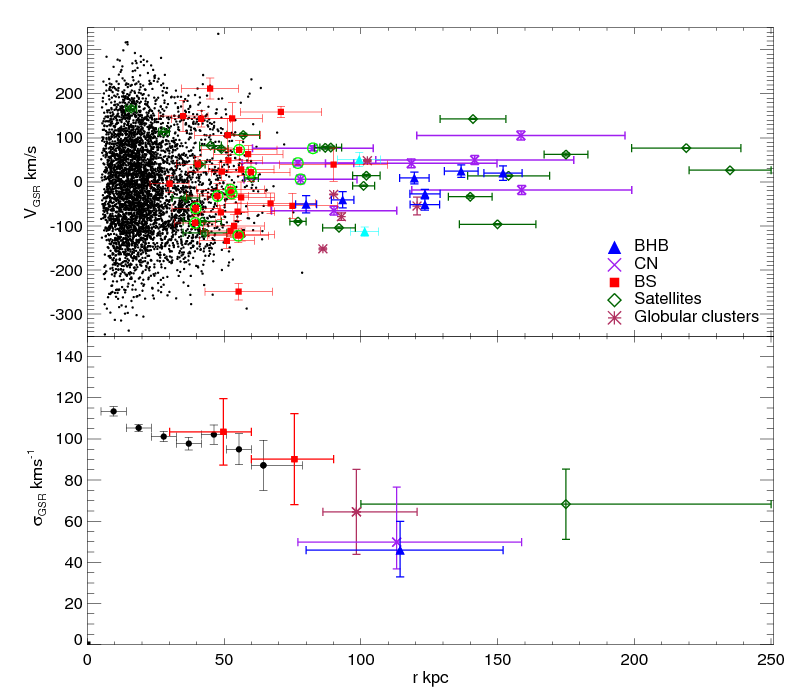 The black points are blue horizontal branch (BHB) stars selected from SDSS DR8 (Xue et al. 2011, ApJ, 738, 79). The red squares, blue triangles and purple crosses are blue straggler, BHB and Carbon (CN) stars from this study. The cyan triangles are 2 distant field BHBs classified by Clewley et al. 2005, MNRAS, 362, 349. The green circles indicate BS and CN stars that likely belong to the Sagittarius stream. The green diamonds are the Milky Way satellite galaxies (excluding Leo I at 250 kpc) and the red asterisks are the distant Milky Way globular clusters. Bottom panel: The velocity dispersion profile of field halo stars. The color coding for the different stellar populations is the same as the above panel [ PNG ]. A. J. Deason, V. Belokurov, N. W. Evans, S. E. Koposov, R. J. Cooke, J. Peñarrubia, C. F. P. Laporte, M. Fellhauer, M. G. Walker and E. W. Olszewski, 2012, "The cold veil of the Milky Way stellar halo", MNRAS, 425, 2840. Paper: MNRAS | arXiv.